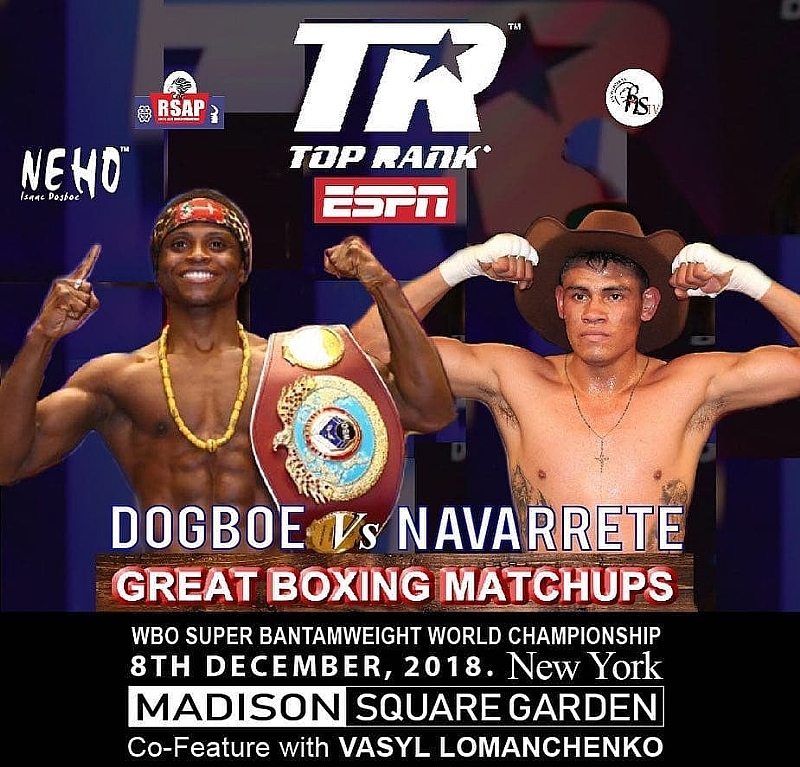 Ghana’s Isaac “The Royal Storm” Dogbe will step into the ring tonight as he aims to defend his World Boxing Organization (WBO) Super Bantamweight title against Mexico’s Emmanuel Navarrete at the Madison Square Gardens in New York, United States of America (USA). The defender Isaac Dogbe boast of a record of 20 fights with 20 wins and 14 by way of knockout. His opponent Emmanuel Navarrete stands with 26 fights, 25 wins and a single loss. His knockout win also fares at 22 and he will surely give the unbeaten Dogbe a tough time. This will be the first time Navarrete will be fighting outside his home country Mexico. At age 24 his record as stated above is scary even though he has been beaten before. He has fought four times this year and has impressively won all. The Royal Storm enters the ring on the back of three wins already in 2018. First, he defeated Cesar Juarez in early January before going ahead to beat Jessie Magdaleno in April to win the world title. He additionally defeated Japan’s Hidenori Otake in August to retain the title in his first defense. Now the Ghanaian boxer remains focused and determined to finish the year on a high when he face his Mexican opponent today. His camp led by his father has already predicted a knockout win for his son. Navarrete, however, will want to prove a point and possibly avenge the painful losses suffered by his compatriots, Juarez and Magdaleno. The high profile bout comes off tonight at half past midnight (00:30GMT). Volta One Television (V1TV), a Ho-based free-to-air television station will carry a live feed of the fight to viewers in Ghana and across the globe.